(Phys.org)—A widely-used tool for studying cellular structure – indeed, a technique in use throughout biology – phase contrast microscopy converts optical phase shifts to changes in brightness. At the same time, several issues in phase contrast microscopy – including reliance on custom instrumentation, the considerable costs of phase contrast condensers and objective lenses, complex analytics, and disruptive sample perturbations – have constrained its application to studying cellular refractive index and dry mass density. 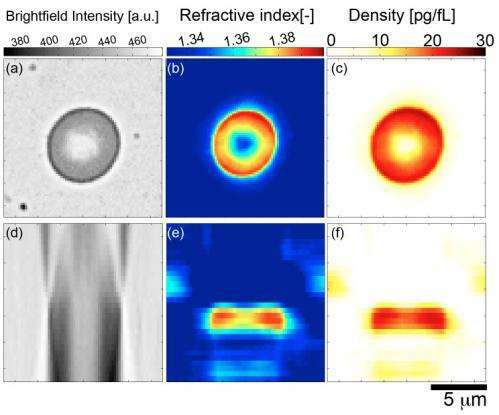 Recently, however, scientists at Oregon Health & Science University demonstrated tomographic bright field imaging (TBFI) – a new optical imaging technique that, using a standard optical microscope, allowed them to perform three-dimensional measurements of these features, along with volume and density, in red blood cells. Drs. Kevin G. Phillips, Steven L. Jacques, and Owen J. T. McCarty faced a number of challenges in designing and implementing tomographic bright field imaging, demonstrating the validity of their technique on polystyrene spheres, and applying the new technique to the measurement of the refractive index, dry mass, volume, and density of red blood cells. "Phase contrast microscopy, while an amazing imaging modality, is problematic from a quantitative standpoint for two reasons," Phillips tells Phys.org. Firstly, phase couples both the height and refractive index variations in each pixel of the image; secondly, the intensity recorded by the CCD camera on phase contrast microscopes is in general a non-linear function of the phase." While the second issue has been addressed in the context of both phase and differential interference contrast, once the phase is acquired, the problem remains to decouple the phase from sample height. "Custom instruments – notably tomographic phase microscopy developed at MIT and published by Choi et al in Nature Methods1 – have enabled this decoupling, but we've yet to see a decoupling occur using a standard phase contrast, differential interference contrast, or bright field microscope in the absence of a priori geometric information concerning the sample." The main challenge in the current study was calibration, Phillips continues. "We tuned our Fourier-based numerical method to capture the essential features of polystyrene spheres. This, in turn, enabled us to measure our axial and transverse resolution at the diffraction limit of the optics." Fortunately, he adds, red cells aren't nearly as problematic as the spheres. Phillips cites several papers when discussing the key insights, innovations and techniques that the team used to address these challenges. "Two great papers came out in 2010 that sparked our interest in this work," Phillips notes, referring to publications by Kou et al in Optics Letters2 and a paper by Frank et al in the Journal of the Optical Society of America A3. "These, in turn, led us to the groundbreaking work of Paganin and Nugent in Physical Review Letters4 on quantitative phase microscopy. All of these papers, and for us the Frank paper in particular," Phillips continues, "laid an excellent experimental, theoretical and computational foundation upon which we were able to derive tomographic bright field imaging. The essential next step they performed was the incorporation of the so-called the eikonal equation – a first-order partial differential equation intrinsic to geometrical optics – into the theoretical mix." Historically, researchers had been using a specific equation that relates intensity to phase (known as the transport of intensity equation) in order to determine phase from intensity measurements. However, the eikonal equation relates phase to the refractive index. Combining the transport of intensity equation with the eikonal equation enables you to relate intensity to refractive index. "Our theoretical model demonstrates that a local aggregation or loss of mass acts like a small lens to concentrate or deplete, respectively, the light along the axis of illumination," Phillips explains. IN other words, tomographic bright field imaging establishes the crucial relationship of intensity variations along the optical axis to the 2D variation of the refractive index in planes perpendicular to the optical axis. The objective lens performs optical sectioning of the specimen, providing independent intensity measurements as the focal volume is translated through the specimen. "We reconstruct the local 2D behavior in each transverse plane," Phillips says, "and combine these to specify the 3D mass density of the cell." With the refractive index in hand, Phillips continues, they could utilize methods developed by Robert Barer which appeared in Nature in a series of letters from 1952 and 1953. Barer had applied results from the 1940s and 1930s – work that demonstrated the refractive index of dilute solutions of proteins was linearly proportional to the mass density of these proteins in a solution – to cells in order to weigh them optically using phase contrast microscopy. "Lastly," Phillips notes, "we used the great calibration work on hemoglobin by Meinke and Friebel in Applied Optics5 to relate our refractive index measurement on red blood cells to the underlying hemoglobin concentration of these cells." According to Phillips, the potential to monitor cellular specimens over time using quantitative light microscopy has been demonstrated only very recently – in, as he puts it, "two ingenious studies" – utilizing custom built optical systems – one (conducted at the MIT Spectroscopy Lab under the late Michael S. Feld) utilizing custom interferometers coupled to microscopes to quantify growth in human red blood cells of the malaria-transmitting parasite plasmodium falciparum, and the other (at the Quantitative Light Imaging Lab at Urbana-Champagne headed by Gabriel Popescu) to quantify the time-varying growth rate of cells. "We're the first to weigh cells on a 'plain vanilla' microscope that most biologists keep around in the lab," Phillips points out. "We hope to leverage the technical accessibility of our method to empower biologists with a new tool to quantify cellular structure over time and the biological perturbations that interest them." Moving forward, the team's next innovations will focus on applying their method to biological questions: How do live cells grow in different settings? What regulates their cytoskeletal organization? Can we monitor the temporal and spatial dynamics of cellular machinery, such as the mRNA transcription factories in the nucleolus, and architectural changes during the cell cycle? Phillips also outlines their research "Excitingly, our interest in developing this technique came from a need to interface with collaborators as a part of our funding and membership within the Physical Sciences in Oncology Centers. The establishment of these centers – there are 12 nationwide, each headed by a clinician and investigative scientist – is an exciting initiative lead by the National Cancer Institute to bring physical scientists, engineers, and mathematicians in close working contact with cancer biologists and clinical oncologists with the ultimate goal of bringing about new ways of investigating, understanding, and hopefully treating cancer. As a part of the center based at the Scripps Research Institute in La Jolla, CA, our Oregon Health & Science University team has been charged with the task of determining the physical properties of circulating tumor cells. These cells are found in the blood of cancer patients – and will hopefully tell us something about how cancer spreads and how it responds to treatment." The researchers' ultimate goal is to apply their tomographic bright field imaging methodology to these cells on order to quantify cancer ultrastructure in the fluid phase across tumor types, disease staging, and the evolution of a patient's disease. Phillips also points out that other areas of research – including lab-on-a-chip based investigations of bacteria, human cell lines, and patient samples – might benefit from their findings. "Our method," he concludes, "will provide a new type of measurement of samples being subject to controlled perturbations without disturbing the function of these engineered systems."